Q: Can the Hitch Critter fit any ball hitch? A: No. The Hitch Critter was designed specifically for a 2 inch ball. It will work on a 1 7/8" ball, but the fit is not as snug. It will not work on a 2 5/16" ball. Q: I don't have a flat plug. Can I still use my Hitch Critter? A: Yes. We designed the Hitch Critter to use the 4-wire flat connector because it is the most universal. If you have a 7 or 6 prong connector, adaptors to the 4-wire flat connection are available at any automotive shop and most discount stores - like Wal-Mart. Q: My cord is too short - what do I do? A: Extension cords are available at most automotive shops for under $5. WalMart also carries an extension at most locations. If your cord is too short and you can't find an extension, please call or email us. We will make sure you get one. Q: I'm worried someone might steal my Hitch Critter. Do you have a suggestion? A. Yes. Use a tie-wrap and wrap it around the cord and the receiver. Q: Will there be more types of Hitch Critters? A. Yes, we have 3 more models planned for 2006. Keep checking the web site for details. Q: Is the brake light legal? A: Hitch Critters must be used in addition to Tail Lights and Center High Mounted Stop Lamps that meet NHTSA and Federal Motor Vehicle Safety Standards. They are intended to augment - not replace - existing safety equipment. As is true of all third or fourth brake lights, Hitch Critters may not be used in place of a vehicles existing safety lighting. Q: What if my Hitch Critter breaks, doesn’t fit properly, or I don’t like it for some reason? A: CALL US TOLL FREE at 1-866-963-8653!!!! WE WILL MAKE IT RIGHT! By the way . . . We test EVERY Hitch Critter before it is put into a box to make sure it works and we have done everything possible to make sure it is perfect for you. Our QC dept. has cooked some in an oven, tested some in a freezer, dropped them, vibrated them, stress-tested, yanked on the cords, and beat the snot out of some of them. Our life-cycle testing shows it should last for over 2 years of normal use. Still, we know that some will break. We will stand by them – just give us a call! We want to sell you more ridiculous junk for years to come – we don’t want to tick you off now. 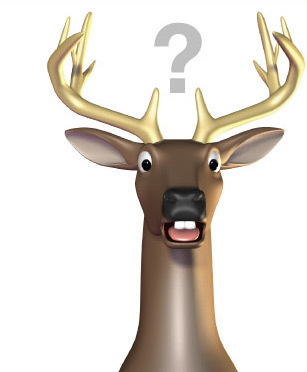 Q: I’m worried about the Don’t Shoot Deer legs falling off. Should I worry? A: You should not worry unless you have a lead foot. We have tested the Deer Legs at speeds of over 90 mph on my piece of crap 1999 Dodge Dakota. The legs stayed on. We were hoping to test it at 100 mph, but the truck was shaking pretty bad and I need new tires. If you are concerned and drive like a maniac, put a drop of crazy glue on the legs. If the legs come off for any reason, call us – we will ship you some at no cost.